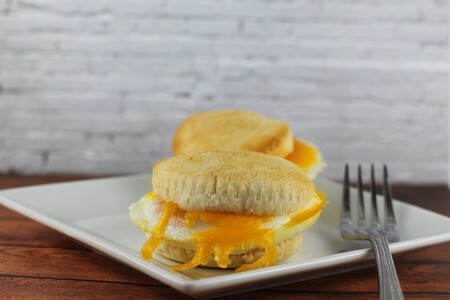 My family loves breakfast sandwiches from a certain fast food restaurant. With a family of 6 this can become expensive. Plus, who knows exactly what is in the hunk of junk you buy. 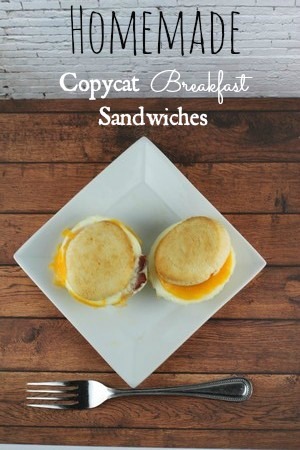 When Good Cook asked me to come up with a creative use for their Whoopie Pie pan (buy on Amazon), I thought it looked perfect to cook eggs in the shape I needed to make perfect and easy homemade breakfast sandwiches. 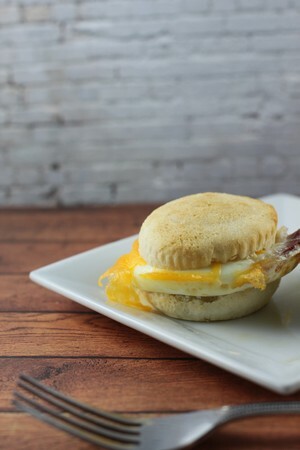 I headed to ALDI to gather up the ingredients I would need – eggs, cheese, bacon, biscuits. You can customize each one easily with these simple instructions. I used a couple different kinds of cheese – shredded cheese and sliced cheese that I used a circle cutter to make fit on top perfectly! 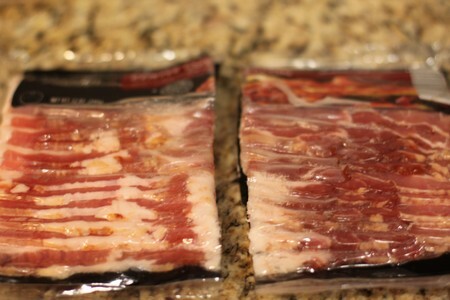 To save time I cut the bacon in half straight through the package. It’s much easier to do this through the package then to try to do it unpacked. 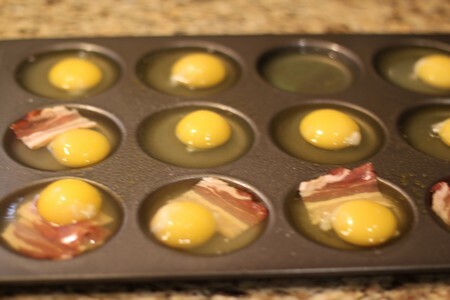 This will make it easy to put the pieces of bacon at the bottom of the pan. I would suggest putting in the bacon before you put the eggs in the pan as it makes it a little difficult it you do it the other way. I kind of forgot about the bacon so I had to slide it under the yolk. It wasn’t a big deal but it could get a little messy. 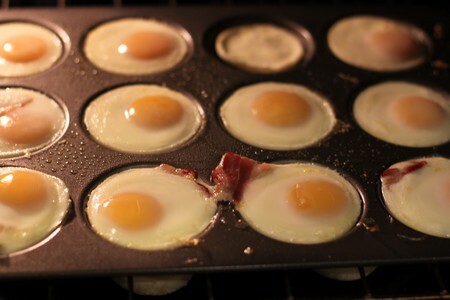 If you don’t want a juicy sandwich, you can beat eggs in a bowl ahead of time and then pour into the pan. Sprinkle with salt and pepper as desired. Then cook at 350 degrees for 10-15 minutes. Take out of oven and top with your desired cheeses. I used a Smoked Cheddar, shredded mild cheddar, and plain ole American cheese slices for variety. Bake until cheese is melted, which is just a couple of minutes so keep an eye on it. Cook biscuits per package instructions. I thought the smaller biscuits would be too small but they ended up fitting perfectly! So go with a smaller biscuit or a junior biscuit to for this particular pan. You can make these in large batches and freeze for later too quite easily. Place sandwiches in fridge to cool down and then cover with paper towel and freeze individually. 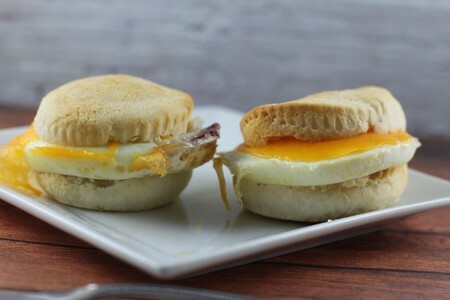 Grab your breakfast sandwiches when desired and warm in microwave for 60-90 seconds or until warm. 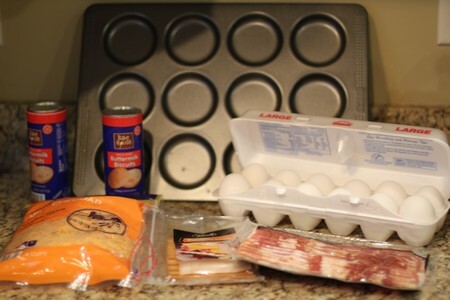 Place bacon or other add-ins in the bottom of pan. 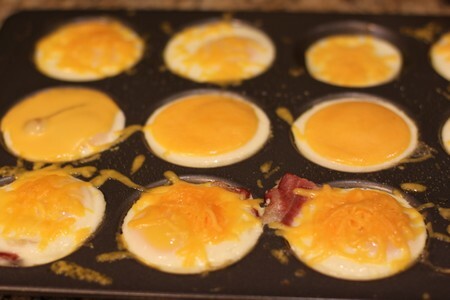 Crack egg and put into pan. Add cheese and cook additional 1-2 minutes until cheese is melted. Cook biscuits per package instruction. 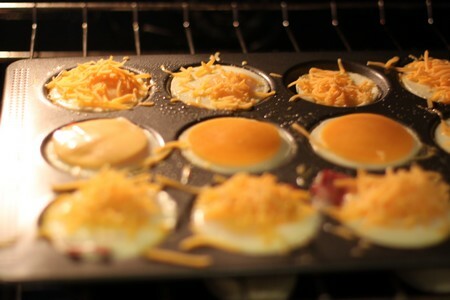 Cut in half and place your cooked egg mixture in the middle. Disclosure: Products were provided by Good Cook in order to facilitate this post. This Post was written by me and was not edited by the sponsor. Read more on my Disclosure Policy.